Keeping It Healthy: Overseeding - How and when to over seed your lawn. Overseeding should follow scarifying of a tired lawn. It will top up bare patches and give your grass a boost. It is best to consider overseeding your lawn during September as an Autumn renovation job. If this is not possible another beneficial time is during April or May as a Spring renovation. Ensure your lawn is scarified to remove dead grass and thatch so you can see the soil beneath. Mow the lawn as usual. Select the correct seed mixture and the correct amount. Sow by hand: - apply seed mixed with coarse grained sand. Or by seed spreader: - apply seed first then topdress with coarse sand. Continue to mow at the usual height when needed. 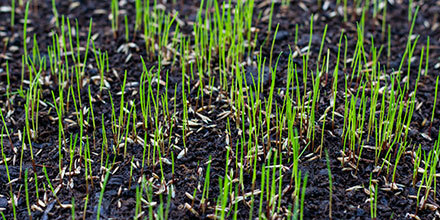 Grass seedlings will continue to grow even with a bit of disturbance from mowing, however, do try to avoid walking on the growing patches. Apply an Autumn/Winter fertiliser or a Spring/Summer fertiliser around a week after sowing the grass seed to give your lawn a good boost.